Home > Used Vehicles > 2015 Honda Civic Coupe EX,SUNROOF,ALUMINUM WHEELS,MANUAL,AIR,TILT,CRUISE,PW,PL,VERY CLEAN SPORTS COUPE!!!! 2015 Honda Civic Coupe EX,SUNROOF,ALUMINUM WHEELS,MANUAL,AIR,TILT,CRUISE,PW,PL,VERY CLEAN SPORTS COUPE!!!! Cylinders: 1.8L I4 16V MPFI SOHC - 4 cyl. Hot Deal! We've marked this unit down $1948 from its regular price of $16900. 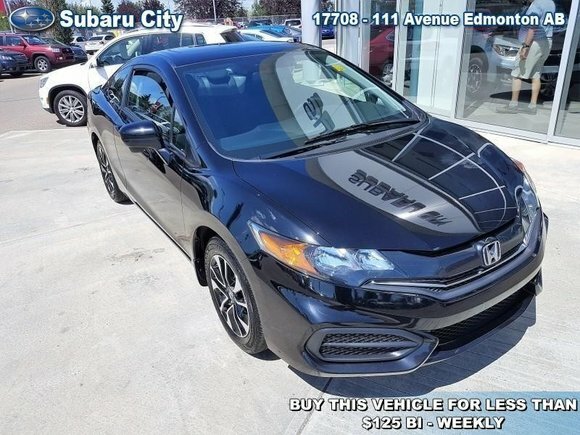 This 2015 Honda Civic Coupe is for sale today in Edmonton. The 2015 Honda Civic Coupe effortlessly blends the need for space with the sleek look of a two-door model. Along with efficient performance, a modern cabin makes this coupe the ideal choice for a daily driver. In addition, modern technology provides the safety and fun you’re looking for in a sporty coupe. This coupe has 59050 kms. It's crystal black pearl in colour. It has a manual transmission and is powered by a 1.8L I4 16V MPFI SOHC engine. This vehicle has been upgraded with the following features: Bluetooth, Rear View Camera, Heated Seats, Air Conditioning. Buy this vehicle now for the lowest bi-weekly payment of $100.16 with $1653 down for 84 months @ 5.99% APR O.A.C. ( taxes included, $790 Administration and Secure Ride included / Total cost of borrowing $3353 ). See dealer for details. Want to try the 2015 Honda Civic Coupe EX?